Greetings fellow archaeologists, archaeologistas, and non-gender-specific-researchers-of-historic-antiquities of the far, far future. 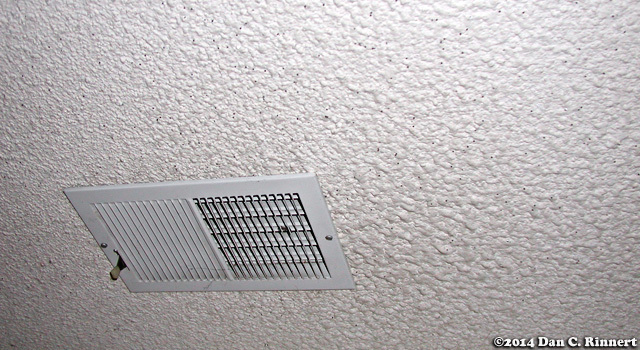 Today we see a ceiling vent of a type we commonly find in homes among a recently discovered neighborhood that was constructed in the late 20th century, before the Great Warming Great Cooling Treacherously Temperate Period in the early 21st century drove people out from this region to cooler warmer more variable climes. Due to the roofs of these homes having dried and caught fire rotted away inexplicably vanished during the centuries between their abandonment and recent discovery, we have little physical evidence as to their intended purpose. However, thanks to the research of thousands of scientists, scientistas and science-researchers-of-indeterminate-genders at the cost of billions of taxpayer dollars, we have concluded that these vents were used by artificially intelligent mice to study their creators in their natural habitats. These viewing vents were present in every room of the house and connected to a central hub wherein the mice could meet and compare notes. They were placed in walls and ceilings to give the mice the maximum number of viewpoints to observe their human subjects. This theory was confirmed by the presence of several rodent skeletons found within the aforementioned central hubs. These hubs also had fans and heating elements and also connected to cooling systems to allow the mice to stay comfortable in their labs throughout the seasons of the year. These viewing vents allowed the mice to watch their humans throughout the day. They also had similar vents in vehicles of the period to allow the mice to accompany their subjects away from their homes, but securely hidden away where they would not be seen, so as not to affect their subjects’ behavior. These in-depth studies clearly gave the mice the tactical advantage during the Great Rodent Uprising of 2257. All hail our current rodent overlords.